Note: This restaurant is no longer in business. Hereford: There is a concerning trend among many places in Charlotte. Many places are touting that they have the “Best Burger in Charlotte” without referencing winning any contest or any impartial basis at all. Is it okay to decide for yourself if you are a restaurant that you have the “best” in anything? Shouldn’t there be a committee for that? Angus: I don’t know if we’re that committee—we’re just two guys and we’ve only started recently—but I know this: if you claim you have the best burger, you better back it up. We take this seriously. Hereford: Probably too seriously, honestly. They’re locating in the Ayrsley town development, an area that feels less like a city than Disney’s Hall of Presidents has of listening to real human beings. It’s not necessarily unpleasant, but I couldn’t imagine living there. Angus: Despite what Hereford says about the area, the location has the potential for coolness. The diner sits right outside of a movie theater, and it would be neat to grab a burger after going to see a movie. Hereford: That is, if the place was open. Eat Here Now closes pretty early. 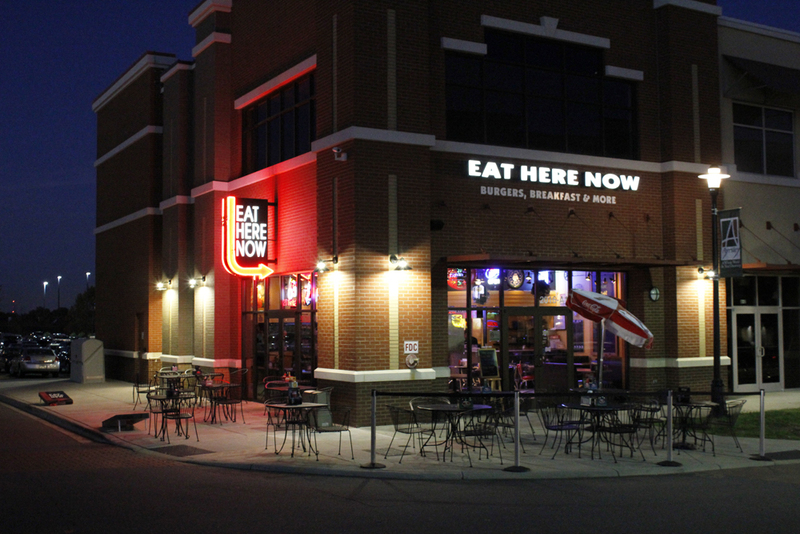 Angus: Yeah, you can “eat here now,” so long as “now” isn’t after 9:00p.m. Hereford: We went on a Saturday about 6:00 pm and there was only one other table occupied when we walked in. I always feel that it’s kind of awkward when there are so few people in a restaurant—that even though they’re probably ecstatic that you’re there it still feels like an intrusion. 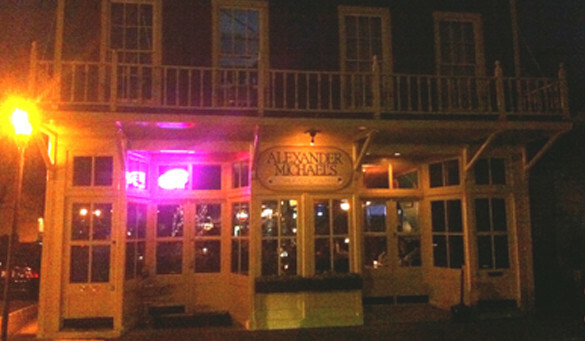 Angus: It’s a small restaurant—only one main room and a patio area. There were several movie posters up, and the walls were decorated with old film reels. They had stage lights hung from the ceiling. I thought that was all pretty cool. One thing I would like to see from a film themed restaurant would be film music. Instead, we were listening to Guns N’ Roses and Bon Jovi. I’m sure they were in something, but it was probably something pretty lame. 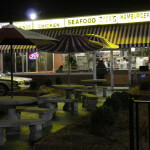 Otherwise, it was styled after a 50’s diner. It had a counter with retro-bar stools—actually all of the tables and seating were retro. Otherwise they had all the normal beer signs that you find everywhere. It had a nice family atmosphere. Hereford: We were in for a surprise when we opened the menu—it looked exactly like the menu at the classic Penguin. Angus: I think the ghost of the classic Penguin is going to be haunting this blog for a while. Hereford: It was organized in the exact same way, and each section was outlined in red in the exact same way. It was actually kind of unsettling. There was no way this was an accident—it seemed more like thievery. Angus: We spoke with someone who confirmed that it was intentionally copied after the Penguin’s. We asked if there was any affiliation between the two restaurants, and we were told no—the man who owned the entire Ayrsley complex (the theater, the residential space, the restaurant space) also owned the restaurant. Hereford: I’m definitely not a fan of the menu theft. It seems to me that you would want more of your own identity and wouldn’t want to copy the Penguin, especially now with the ownership issues and the controversy. They’ll definitely receive a demerit for that. Angus: Upon the review of the beer menu, we were disappointed that it was so dominated by the big 3. There was a lot of Bud, Miller, Coors, and their different variations, but not much else beyond that. The only two beers I could get excited about on the menu were the Newcastle and the Purple Haze. Hereford: But there was a lot I could get excited about on the burger menu, though. They had a lot of options, including some specialties not on a menu that they had listed on a chalk board on the outside. 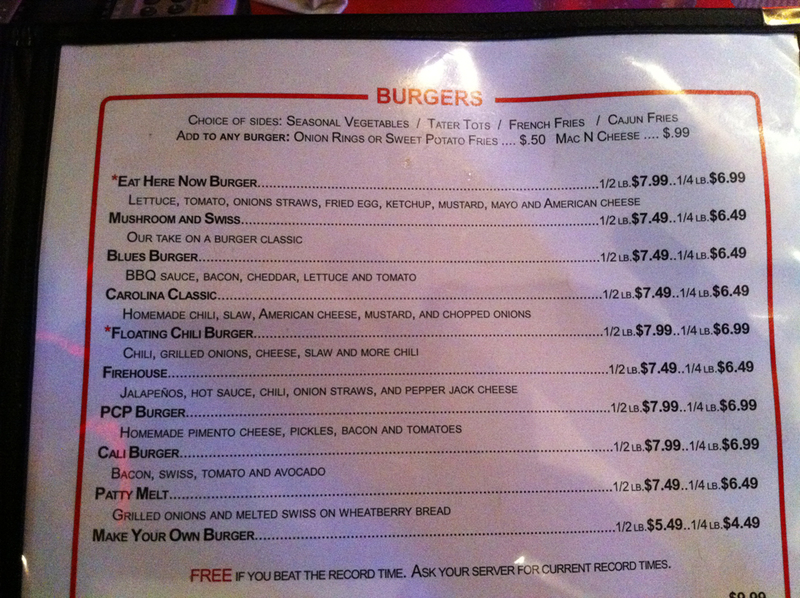 Including those specialties, they had a dozen or so choices for preparing your burger, including a “make your own” option. But, the one that really caught my eye was the PCP burger. Why would you name a burger after the drug otherwise known as angel dust? Seems like a big mistake. PCP is a dangerous drug—why would you want to ever want to have a burger named after that? You would never name food heroin, or meth, right? What about LSD? Angus: Well, the Mellow Mushroom definitely cashes in on that association. I did ask our server in jest if it contained actual PCP. He politely humored me, as I’m sure he’s heard that joke far too many times. If I was a server I probably would have given me a dirty look. Angus: I have to say, I was definitely impressed with our service. It may have just been that there was no one else there, but he was very nice. When it came time to order our burgers, I again got the double cheeseburger. 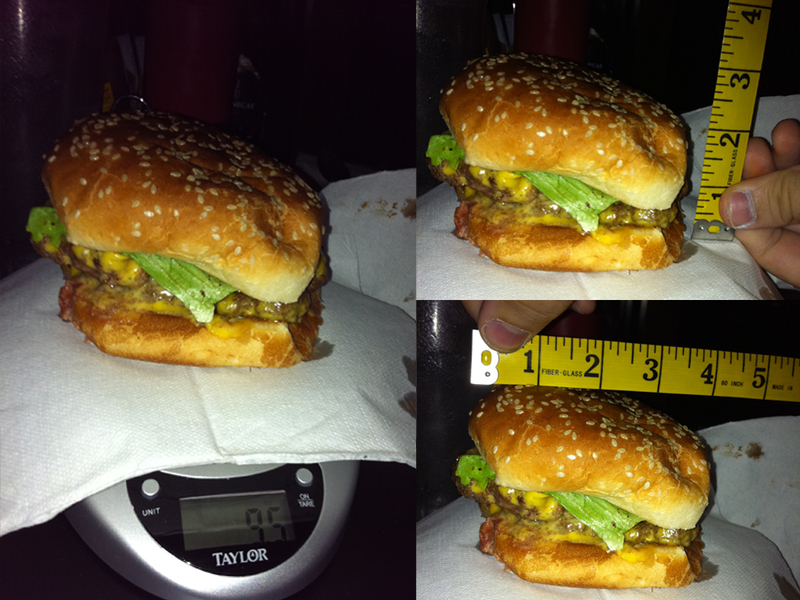 Every burger option had a 1/4 and a 1/2 pound option—with the half pound containing an additional patty. I was forced to use the “make your own” option to get a double cheeseburger, as they didn’t have one on the regular menu. One of my personal beliefs is that every hamburger restaurant should have a special place on their menu just for cheeseburger. To not have it is an oversight. I was impressed to see that Eat Here Now also had a large selection of cheeses. For this burger I went with plain old American. Hereford: I again got the specialty burger. I was eying the Aloha Burger, which was on the chalkboard outside of the restaurant, but our intrepid server suggested to me the floating chili burger. I initially balked—I was looking for something more out of the ordinary—but he insisted it was excellent and their best specialty burger. In fact, on the menu it had an asterisk next to the item denoting its specialty status. The Floating Chili Burger is described as having “chili, onions, cheese, slaw and more chili.” They have to list the chili twice! It seemed daunting. Angus: One of the things I was excited about on the menu was the food challenge they had there. While neither of us has the stomach or the appetite for such a challenge, I love knowing that they are there. And we have a close friend who loves to compete in them. When we return to Eat Here Now, it will likely be to see if he can beat the record time there for their challenge food. Hereford: After an extremely short wait time of 7 minutes—which, considering we were the only people ordering at the time, it should have been short—our burgers were delivered. Angus: So, mine was really good. It was what a classic cheeseburger is supposed to taste like. 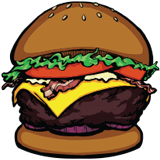 You could still taste the grill—the sizzle from the left-over grease from the previous burgers. My bun was a little soggy, because the burger was a little greasy, but I really loved that it was slightly toasted with just a taste of butter—perfect. Herford: So, we had to make a special not to show how my burger was presented to me. 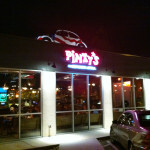 It was, just as the name of the burger implied, floating in chili. Not only was there a ton of chili on the burger, but some extra scoops of it were included on the side, along with their sautéed onions. 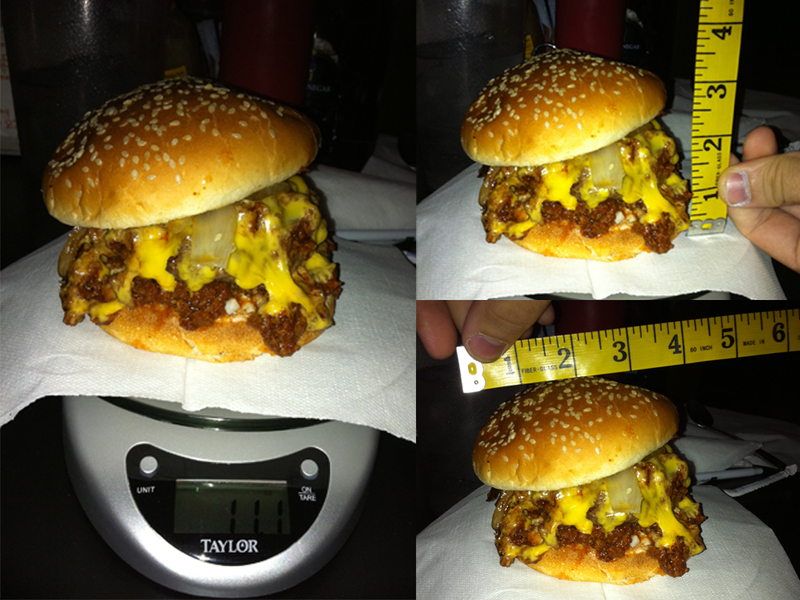 When we placed my burger on the scale, I was shocked to see that it weighed in at over 11 ounces—there was so much chili on it that even though it was only a quarter pound burger, it outweighed Angus’s half pound burger. It was a lot of food. And I devoured it. I was very hungry when we came in, so I made short work of it. I barely noticed the slaw and the cheese, as the star of this burger was definitely the chili and the onions. The chili was good and flavorful, and not overly spicy. The onions were large chunks of sautéed onions that were fantastic. Since it there was so much chili, it was kind of greasy—that’s to be expected. The grease made mush of my bottom bun, and to finish it by turning it upside down. There is a strong possibility that my burger was also lightly toasted with butter, but I couldn’t tell under all that chili. Angus: We each got fries—I got the regular fries and Hereford got the Cajun fries, but I found them somewhat disappointing. They were hand cut, which is awesome, but I found them to be a bit greasy. Also, and this made me angry, Hereford got more fries than I did. I agree though, my fries were greasy too. And, the Cajun seasoning was not very flavorful. But, I barely touched my fries. I probably would have had more of them if my burger wasn’t so massive. Angus: So, to wrap up, we really liked this place. It seemed like a great place to go for lunch or to take the kids, with a lot of fresh food and a lot of choices. Food: 4 – We really loved our food. It was excellent. I thought it was slightly overpriced—it was grill styled burgers at gourmet burger prices—but you got a lot of good food for it. 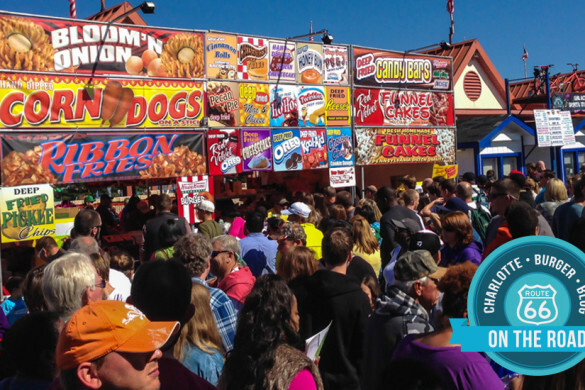 Service: 4.5— We always hesitate to give 5s, and I thought that the service was really good, but it just might be that we were the only ones there. Theme: 3— We liked the film theme, but they didn’t carry it as far as I would want to. None of the menu items had any film references and like we said before, we would have liked to hear some film soundtracks. Atmosphere: 2—This may be hard to judge, but since there was no one there. It made it seem kind of awkward. But although they had beer there, it didn’t seem like a place you would want to drink at. 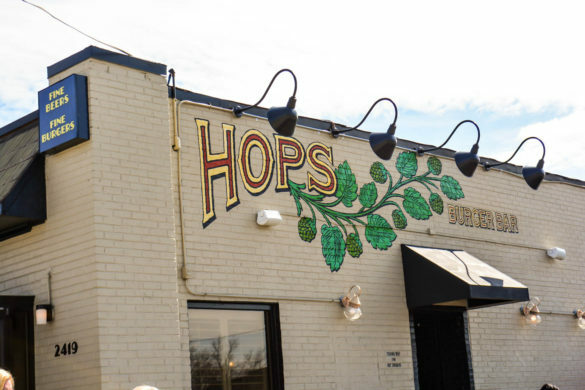 Beer Selection: 1.5—Almost entirely Big 3 selection, which we are not very impressed with. However, they did have Purple Haze. And they have $1 Miller High Lifes every day, which is a fairly good deal.